Read the information below, or watch this short video explaining all the options. 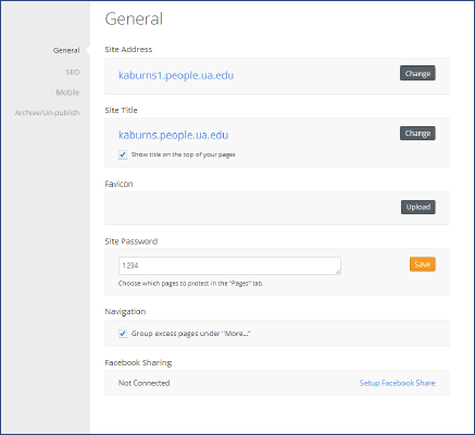 The Settings tab provides you with some very important options, including setting a site password and SEO settings. There ARE, however, a few things you may NOT change. Be cautious and make certain you fully understand any changes you make on this tab. Site Address - DO NOT CHANGE! You may possibly break your site by changing the address of your site. Site Title – It's not recommended that you change the site title. That affects the back-end site administration. You may, however, change the title within the header itself. Favicon – DO NOT UPLOAD A NEW FAVICON. Site Password – you may set a site password and apply it to one or more pages of your site. Navigation – all sites, by default, group excess pages under “More…” in the navigation bar. You may change it, if desired. Facebook Sharing – This function is not connected and will not work. You may use the social icons element to direct visitors to your Facebook page. Site Description and Meta Keywords - This is a VERY IMPORTANT part of your website. So important, we have a dedicated page that explains it in detail. Please visit the SEO Tools section of this manual. Footer Code and Header Code – Use this section for placing code from Google Analytics or Webmaster tools. 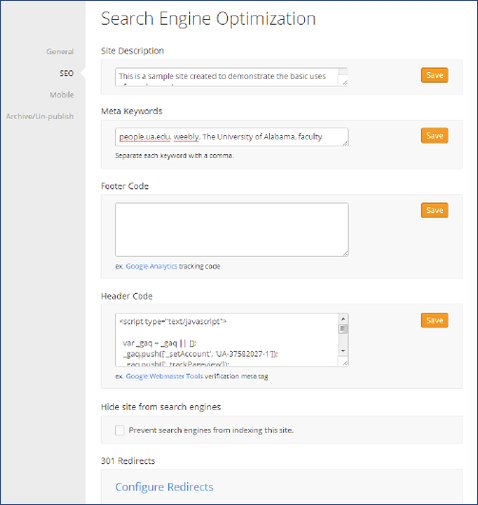 Hide site from search engine – You may choose to hide your site by checking the box. 301 Redirects – Use this function if you are moving your site from one URL to another. Visit http://kb.weebly.com/301-redirects.html for complete information. Enable Mobile - Turned on by default. This section ensures your visitors will have the best viewing experience when visiting your site from a mobile device. This section may not appear on your site. However, we want you to understand its use by our administration team. It will enable us to help serve you better. Archive - We will create an archive of your site after it is published for the first time. We will email you the .zip file. Save it somewhere safe, that you'll remember, just in case your site should ever become damaged or destroyed. It has not ever happened, but anything is possible. If you make major changes to your site, let us know and we will be happy to create a new archive for you.